The exhibition “Ancient Theatres of East Mediterranean” is a photograph exhibition based on the work of photographer Maria Stephosi and aims in the acquaintance of the public with theatre in antiquity, through an intensive experimental process, with clear entertaining and educational character. The aim of the exhibition is to answer to a series of questions that sometimes enforce and sometimes devitalize the relation between modern and ancient theatre… Why it is believed that theatre was born in Greece? What are the features of ancient theatre that still exist in our days? What is the theatrical practice of antiquity? What are the architectural attributes of ancient theatres? 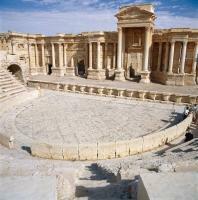 Why ancient theatres can be found in so many places worldwide? The significant photographical material of the exhibition creates a parallel area of aesthetic pleasure, providing to the public the possibility to meet ancient theatrical edifices of East Mediterranean, as they are maintained today. The exhibition material, that consists of clothing from modern theatrical plays, which were generously ceded by National Theatre of Greece, Art Theatre and Theatrical Artistic centre “Poupoulo” (Feather), schedules and posters of indicative theatrical plays and reproductions of ancient items, allows constant counterpoint between ancient and modern theatrical practice. Parallel to this, the exhibition is completed with theatrical games from the collection of Games and Infantile Age of the Benaki Museum and with scenes of “Epikera” (Journal) from the beginning of 20 century, from the collection of Thessaloniki Cinema Museum.